We are fast approaching another anniversary (Oct 31) of the death of Harry Houdini. I thought I'd take some time and share with you some information about his grave site. His grave has been in the news quite a bit recently due to the wonderful work of the Houdini Museum in Scranton PA. They have taken it upon themselves to restore the Houdini bust to the grave site. Let's take a trip back in time. It's 1885 and Houdini's half brother Armin/Herman died of turberculosis. Young Erich offered up his entire life's savings ($10) towards his half brothers funeral. Herman had a typical shaped tombstone with a rounded top. 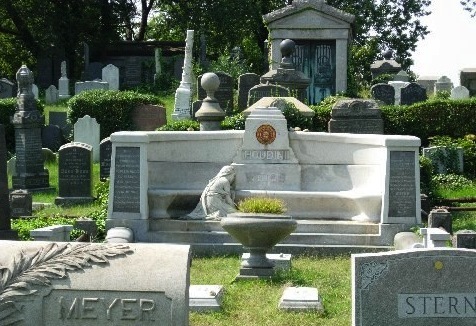 Seven years later, Houdini's father dies in 1892 and is buried next to Herman in the Machpelah Cemetery in Queens NY. The father was given a tall pillar shaped tombstone as can be seen in the photo. 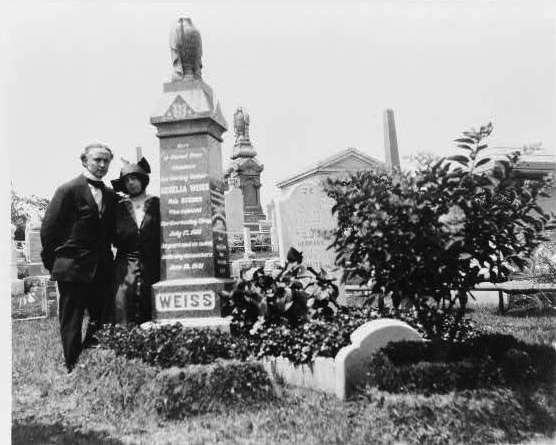 Between the Weiss grave and the tree on the right is Herman's tombstone. In 1913, Houdini's mother Cecelia Weiss passes away. Those familiar with the Houdini story know how this affected him and altered the course of his life. Cecelia was buried in this plot also. Cecelia's name was added to the large pillar like tombstone. Houdini though was devastated. He visited the grave often and eventually came upon an idea of buying a larger family plot and erecting a monument to the family. This was called the 'exedra' which means resting place. The design however was done by a friend of Houdini's Oscar Teale. Oscar Teale was an architect by trade. But he was also an amateur magician. He served as the fourth President of the Society of American Magicians and wrote a book called 'Higher Magic'. It's said that Oscar Teale was also Houdini's Ghost writer on a number of project including the tome 'A Magician Among the Spirits'. He designed the exedra for Houdini. The finale cost of the monument was $40,000.00. It was installed at Machpelah Cemetery on October 1st 1916. One interesting addition to the exedra was the inclusion on each side of the monument of part of the original Weiss Grave. On the far left is the gravestone face for Cecelia Weiss. On the far right is the gravestone face for his father Mayer Samuel Weiss. 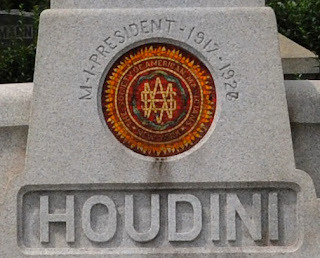 Another unique feature is the emblem of the Society of American Magicians which is in the center of the monument just below the bust of Houdini. Harry Houdini served as President of the Society for several years and was the current president when he died in 1926. I can't help but wonder if the emblem was added after Houdini's death. It wouldn't make sense to have it on there in 1916 when the monument was erected. There is one photo in the Silverman Houdini book which shows Houdini sitting on the exedra as it was being built. No circular hole is there for the emblem. So it likely was added later. Houdini had his family moved to the new site and made arrangements for the rest of his family to be buried there upon their individual deaths. The only spouse however that was accorded a grave was Bess Houdini. Her name was added to Houdini's gravestone, but truth be told she is not there. Because Bess was Catholic and Machepelah was a Jewish cemetery, she was buried elsewhere. Houdini did not want his brother Leopold buried there because of the personal feud they were having. Houdini felt that Leopold disgraced the family by marrying his brother Nathan's ex-wife on a few days after they divorced. But apparently, Leopold is there, though his gravestone is not. Houdini's sister Gladys is also buried there but her gravestone is missing as well. Those two stones were taken out to be repaired and have never been returned. There are 9 Weiss's buried in that family plot; Mayer Samuel (1829-1892), Cecelia (1841-1913), Herman (1863-1885), Willie (1872-1925), HOUDINI (1874-1926), Nathan (1870-1927), Theo/Dash Hardeen (1876-1945), C. Gladys Weiss (sister) and finally Dr. Leopold Weiss. But there is a tenth person buried in the cemetery that never is mentioned. Perhaps people have forgotten about her. Hannah Steiner, Cecelia's mother is buried there. Houdini had her disinterred and then placed next to Cecelia sometime between 1913-1916 as a 'birthday gift' to his mother. Strange, sure, but this was Houdini. There is a gravestone there which reads Grandmother 1821-1887. This was Houdini's grandmother, his Mom's mother. She is between one of the marble benches and Herman's grave. Houdini paid for perpetual care of his family plot but the care stopped a long time ago. The SAM Parent Assembly #1 was originally taxed with the duty of taking care of the plot or paying for it's upkeep. But for reasons which remain 'cloudy', the Parent Assembly has not paid for upkeep in a very long time and has a strenuous relationship with David Jacobson who takes care of the cemetery. 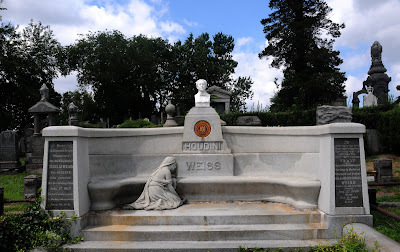 However, others, like the Houdini Museum, have recently contributed greatly to the gravesite and are responsible for the restoration of the bust which now adorns the site once again. I do have a fear that Machpelah may end up like Mt. Moriah Cemetery in Philadelphia, some day, and the magic community owes to the memory of the greatest magician of all time to care for his grave. This video is from John Cox the man responsible for the incredible site WildaboutHoudini.com. Please watch the video because John shows the back of the exedra which is rarely seen. Enjoy! Brilliant work, Dean. Thanks for the read! Thanks for the shout out, Dean. Great post. I always wondered about that Grandmother grave. How cool that we now have a pic of her (thanks to you). George Schindler, the dean of the Society of American Magicians, said his group had stopped contributing money toward the maintenance of the site in recent years. He said David Jacobson, “sends us a bill for upkeep every year but we never pay it"
Please be reminded that Houdini, is the man who made the growth of the Society of American Magicians possible, which is often called the single largest movement in the history of magic. Thanks to Houdini's original hard work, and later others, the organization now has about 300 clubs and between 5,000 and 6,000 dues paying members. According to tax filings they collect about a half million dollars in dues each year. Seems time they pay to take care of Houdini's grave each year, or in perpetuity. "The Only Building in the World Entirely Dedicated to Houdini"
Thank you for this addition. This article was written back in 2011 before I knew of what was going on. It's an unfortunate situation to say the least. The SAM should be taking care of this. On reading this post I really get goosebumps. Thanks for sharing this mystery of the Houdini Grave.